We’ve released an update for SL developers today (the JSON-formatted HTTP responses and the new API command). Read details here (and subscribe to developers’ blog). Also, a minor HUD problem (“Setup” page on/off checkboxes for Trusted Managers) has been fixed. The update is server-side, no HUD update is required! Personal Bot HUD – v6.0 Update! Personal Bot HUD allows you to remotely control your bot, such as to sit on specific objects, stand and even command your bot to use favorite animations. HUD works more smoothly and consumes a bit less sim resources now. We’ve replaced the “Items” with a new “Tools” tab. 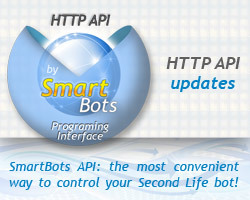 It allows navigating to SmartBots’ most used add-ons: Local Chat, Live IMs, Simple Autoresponder and Sim Governor. It allows your bot to touch objects in-world using the object’s UUID. Your bots can now easily touch Tip Jars, Online Boards, Sploders and other things. New Personal Bot HUD controls are also look a bit smoother. 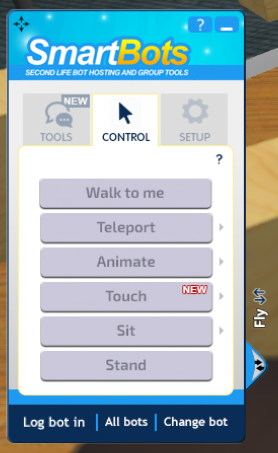 You can get your new Personal Bot HUD in SmartBots in-world store. 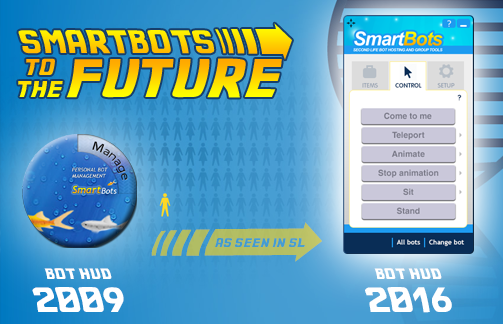 SmartBots Personal Bot HUD allows you to control bots remotely: make it sit, stand, follow, rotate and perform other useful actions. and refreshed look and feel. 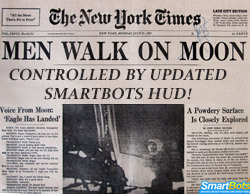 You can get your new HUD in SmartBots in-world office or by logging in to your account. Bot HUD v4.0 has been released! A new version of Personal Bot HUD is now available. 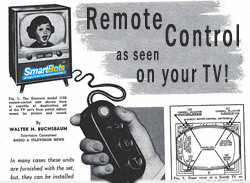 This is a mostly technical update: we’ve rewritten the codebase of the device completely. The HUD scripts require less memory and contact main server in a more secure way than before. The new HUD also introduces a user interface improvement. Now, when you make your bot sit down on object you highlight, bot verifies if it actually sees your selection beam (sometimes viewer settings prevent your beam to appear in-world). or visiting SmartBots in-world office vendor.